WallCandy Arts is offering a special offer for Father’s Day from now until June 20th 11:59 pm EDT, you can get these white board wall panel decals and help keep Dad organized for 10% off. Soccer games, play dates, meetings and more can all be organized easily. These would also be great to sneak a “honey-do” list on (snickers)! 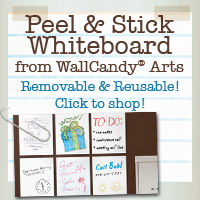 Plus they are removable and reusable and won’t damage your walls, gotta love that! To receive 10% off your white board order use discount code – code10 – at checkout. Hi, thank you for following, I’m stopping by to gladly return the follow. Hi! Stopping by from the blog hop. I love your crafty ideas and fabulous finds! Cute blog!! Newest follower from the hop! Hope you can come by and check my blog out. Really like your blog and the cute ideas you have. stopping in with the welcome wednesday hop!